Boredom is the enemy of Joshua Young. Three days a week he’s up at 5 a.m. for physical training with the University’s ROTC program. And he rarely stops going until long after the sun goes down. Outside of classes, Young’s mentoring in the community, attending Jepson Student Government Association meetings, planning with fellow Common Ground cultural advisors, or rehearsing with the Octaves. He also patrols and serves as president of the Public Safety Auxiliary. Until last fall, he volunteered through the Bonner Center for Civic Engagement's PACE program with the city’s Young Adult Police Commission, a program he was first part of while a high schooler at Franklin Military Academy in Richmond. 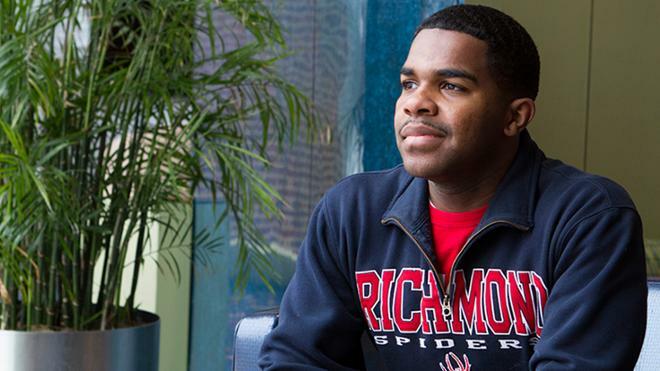 Young came to Richmond as a Gates Millennium Scholar, but he didn’t always so easily find his place. During his first semester, he called his grandmother every week, insisting he wasn’t going to fit in here and that he wanted to leave. Young is currently the only person of color in the ROTC program. And when he first was invited to join the Octaves, he says he couldn’t help but wonder whether he was selected more for the diversity he’d bring than his talents. He’d had no formal vocal or musical training like many in the group. Young’s experience was singing with his church choir. His sight reading, he says, is still a work in progress. But realizing their offer was a genuine realization of his potential to contribute and of his dedication marked a turning point, one that helped him not only find his place here but also to think about the ways in which he could be a force for positive change both on campus and in the city. He was valued. He belonged. Young counts the relationships he has built with both fellow students and administrators as some of his most treasured. If not for them, he wouldn’t be here. And Young says he certainly wouldn’t have stayed. He could have easily transferred, and other institutions have been inviting him to. But instead of leaving, he’s abundantly present here — from his work as a cultural advisor planning programs (and helping others find a sense of community) to leading the committee planning the campus commemoration of Black History Month and making award-winning music with the Octaves. Somewhere in there — between the physical training and a dizzying list of extracurriculars — Young has realized he wants to use his story as a roadmap to help others in his community explore issues of social justice. He has pursued coursework that has advanced his understanding of poverty and social justice in Richmond and encouraged him to think critically about what role he can play in helping address these issues in his hometown. “This place has kept me close to what I’m passionate about,” Young says. “And being here allows me to explore the ways in which I can foster change. Editor’s note: In May, Young will be part of a team of students and staff completing a 100-kilometer walking pilgrimage in Scotland and England. Next year, he will study abroad in Jordan to hone his Arabic language skills with the help of a David L. Boren Grant from the National Security Education Program.